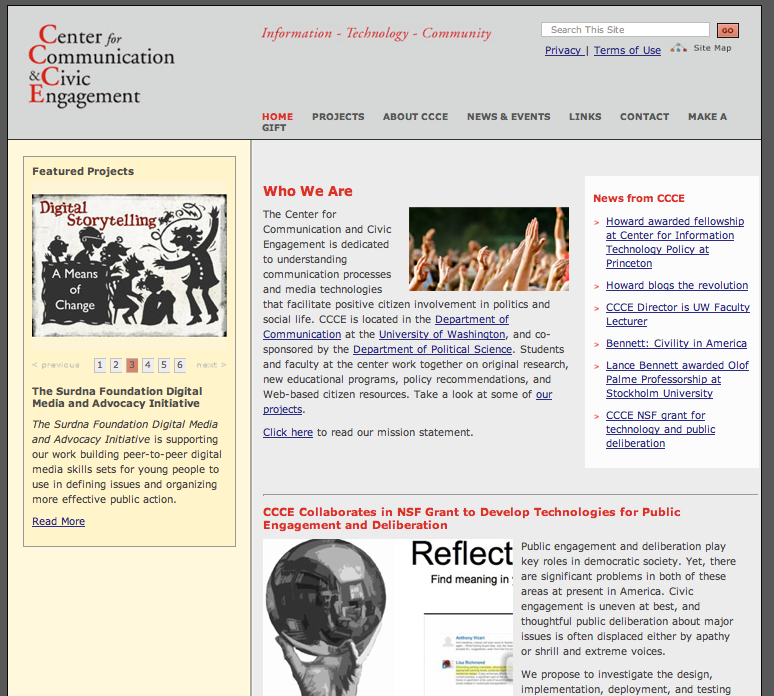 Located at the Department of Communication at the University of Washington and co-sponsored by the Department of Political Science, the Center for Communication and Civic Engagement is devoted to developing new areas of citizen involvement in politics and social life through the creation of citizen resources and student-designed learning experiences. The main aim is to allow students from across the university to work together on original research, new educational programs, policy recommendations, and Web-based citizen resources for students, scholars, journalists and the public. The website offers classification and detailed annotations to a large sets of recods, concerning infos on the center’s projects and staff as well as publications and conference programs, with high updating frequency. It also gives access to a database of literature about how information and communication technologies are being used to solve social problems in developing countries. The website includes project reports, academic research, working papers, pre-prints, committee proceedings, scientific and technical documentation. Records are provided free of charge, searchable through sophisticated search engine and downloadable in their original formats. In addition some navigational facilities, such as site map, support item-location and immediate orientation.